If you have any questions or suggestions you are welcome to join our forum discussion about Pullbacks in a Strong Trend – One of the Most Profitable Trades. Pullbacks can be extremely profitable when they are forming in a strong trend, and therefore you want to tap that potential as soon as you notice that the market is firmly moving in a distinct direction. Of course, spotting a strong trend is not done so easily from the start, before a decent number of bars have shown trending highs and low. And because for pullbacks to happen you actually need a relatively strong move, you probably won’t see the profitable pullbacks in a strong trend in question for at least one or two hours after the trend has begun. The most profitable setup is a two-legged pullback to the moving average. At first, many traders think that the pullback to the MA might not trigger any large move afterwards, but what it usually does is a with-trend acceleration toward the trend’s extreme, which it in most cases breaks and continues its move further. Here is an example. As you can see on the screenshot, the market was bound in a range, after which it formed bullish stairs, which formed a rising channel. Although the second-to-last stair failed to keep up the rising pace of the previous ones and even made a larger pullback, the last move up managed to stay in line. As you already know from our article “Wide Channel Trends“, the stairs pattern signifies a modest trend, which however sometimes can accelerate – like in our case. The market accelerated to a new session high at (1), followed by a small pullback, which was actually an inside-inside pattern. Although inside-inside patterns in most cases lead to reversals, there was no follow-through on the small bear bar after the inside-inside pattern and the market broke to a new session high, at (2). The price then pulled back to the moving average and even overshot the trend line at (3), which is what many traders had waited for. There were several retests of the trend line, followed by an acceleration to a new extreme at (4) and a later consolidation. As we’ve said in the article “Trend Trading Guidelines“, when a strong trend is in motion, traders don’t need to wait for a special setup to enter the market, which will cost them time and missed opportunities, and should rather hop on at any point, and especially on pullbacks. We now also know that during strong trends, traders should scalp a portion of their position and swing the other portion, holding onto it until a major reversal comes, or the market enters a trading range. Keeping a part of your position on the market throughout the strong trend is key for capitalizing on the profitable opportunities the market provides you with. 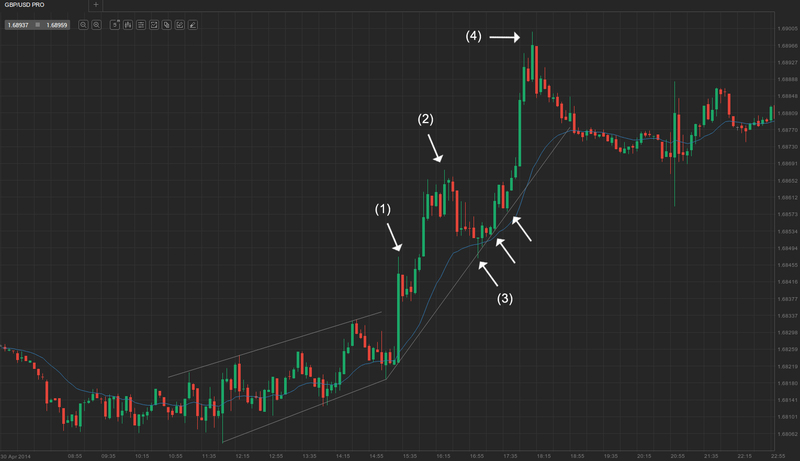 This however introduces the risk of losing your swing portion, if a deeper pullback triggers your breakeven stop loss. However, in most cases, the strong with-trend runs will earn you so much money, that they will exceed multiple times the losses caused by occasional hits of breakeven stops. At each new pullback setup, traders add back the scalp portion of their position, which they had previously locked in, and keep it until their next profit target is reached. Moreover, some riskier traders add back not only the scalp to their swing portion, rather a whole position. Later, when their scalp profit is hit, they remove the scalp portion and so they are left with two swing portions. However, this tactic is suitable for more experienced traders who are used to managing larger positions because scaling in carries the risk of unwillingly growing your position to an uncomfortably large size, which in terms will make novice traders nervous and might cloud their judgement. Apart from moving average pullbacks, another suitable with-trend entry signal is provided when the price tries to break through micro trend lines but fails, marking a High 1 in a bull trend or a Low 1 in a bear trend. As explained in the article “Counting bars in order to detect end of corrections”, a High 1 is the first bar whose high is above the previous bar’s high during a downward move in a bull trend. 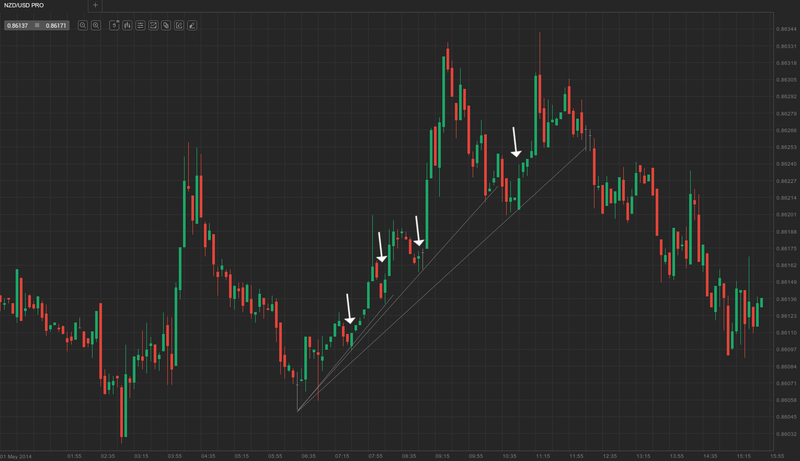 Logically, a Low 1 is the first bar with a low below the low of the previous bar during an upward move in a bear trend. Thus, the formation of a High 1 or Low 1 signifies the end of a counter-trend move and generates a with-trend entry signal. You can see several such entry bars on the example below, with the last one suggesting a pullback entry off the major trend line.